Favourite posts and the latest news about dogs and cats this month. “It hit me that there is such a massive disconnect between what people think their dogs are doing and saying and what is really happening, and everyone suffers because of it. “ Marc Bekoff interviews Tracy Krulik about the impetus for iSpeakDog. So you think you have a ‘master forager’? Ingrid Johnson at Fundamentally Feline on how to make food toys harder for your cat. Shocker: some cats like people more than food or toys by Karin Brulliard. Joii the sniffari movement. Why I DON’T train my clients’ dogs to heel by Kristi Benson. Jeff deYoung: The dog who saved my life and came to live with me. Is there such a thing as a “purr-cebo” effect? 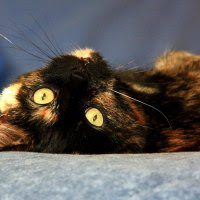 Mikel Delgado looks at new research on the placebo effect in cats. Things to know on dog farting awareness day by Julie Hecht. Dog day care put shock collar on my dog without permission, owner says. An anxious dog in Chicago was found to be wearing a shock collar when the owner went to pick them up, according to this report. Stricter regulations for rescue centres in BC. The Animal Welfare Advisory Group in BC is proposing standards for rescues. Quebec is introducing legislation to ban pitbulls and other breeds, including Rottweilers, American Staffordshire Terriers, Staffordshire Bull Terriers and certain cross-breeds – and they say they may add to the list in future. Taiwan has banned the consumption of dog and cat meat. Charities united to highlight brachy health issues in cats and rabbits, as detailed in this post from International Cat Care. Philadelphia police use carrots to round up a loose horse. A 10-year-old in Markham, Ontario, got permission from council to keep a pet hedgehog. Instead of changing the bylaw (which bans hedgehogs as pets) she was granted an exemption. Muzzle Up seminar at the SF SPCA on 13th May. Photo-essay of street dogs in Goa. Photos of dogs from underneath. Under-dogs by Andrius Burba. Maro the cos-playing cat chef. Meet Kinako the cat and Jiji the grandpa in these photos by Akiko DuPont. Watch John Bradshaw talk about how your dog sees the world. This podcast from the Writer’s Voice with Francesca Rheannon features Amy Sutherland talking about Rescuing Penny Jane and Sarah Ellis talking about The Trainable Cat. Giving older dogs the good life. Dr. Alicia Karas joins Julie Fudge Smith and Colleen Pelar at Your Family Dog Podcast. It’s been a busy month! Companion Animal Psychology turned five, I have a new blog at Psychology Today called Fellow Creatures, and I’m delighted that Greystone Books have agreed to publish my book Wag: The Science of Making Your Dog Happy. The winner of the Best Friends of Companion Animal Psychology photo competition to win an anniversary mug is this lovely photo of Allie, sweet sixteen, by Jean Ballard. This month, the book club is reading The Other End of the Leash: Why We Do What We Do Around Dogs by Patricia McConnell. This month’s blog posts included a new literature review recommends reward-based training, people’s perceptions of adoptable dogs are better based on video than photos and olfactory enrichment for cats can include catnip, silver vine, Tatarian honeysuckle and valerian. As well, I spoke to Dr. Lee Dugatkin about his book How To Tame a Fox (and Build a Dog) and the fascinating history of the Russian fox experiment. 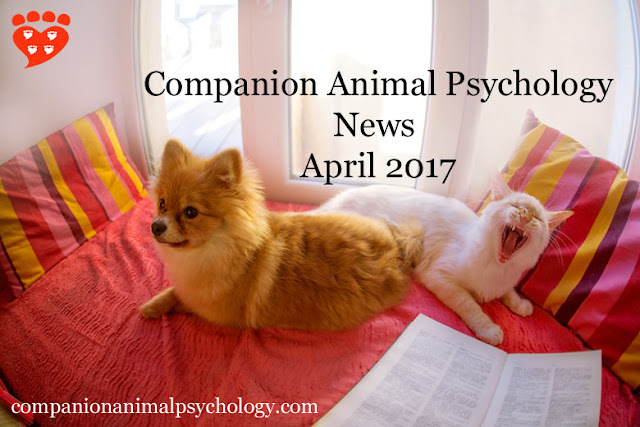 Don’t forget to subscribe to Companion Animal Psychology!